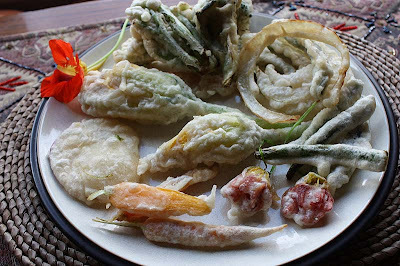 Some people have fish and chips on Friday night, I have just had vegetable tempura. Everything on the plate is from the allotment: squash, courgette and nasturtium flowers, green beans, baby carrots, turnip, white onion, broccoli and the smallest ever cauliflower. I do not have any sweet chilli dip in my kitchen cupboards, so had to do with Levi Roots fiery guava dipping sauce. It wasn't very fiery, but it worked well with the vegetables. Now who has been a good girl and had her five veg a day. I have, I have! 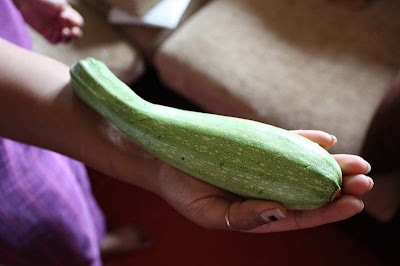 Look at the stalk, as if it is made out of green felt. 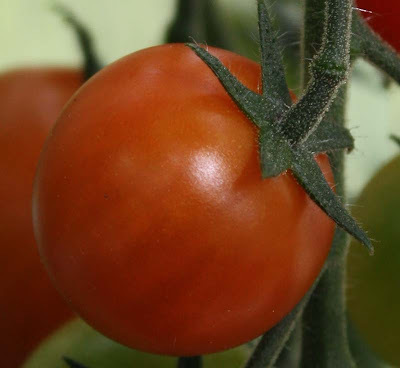 literally ripening before our eyes. Ooh I better start thinking of those tomato recipes. 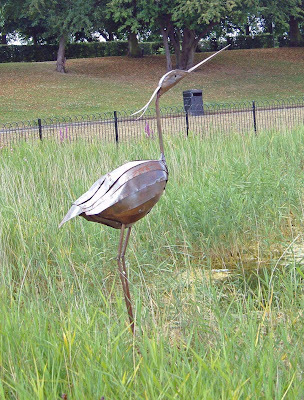 For those of you who have been following me from the start, you will know of Fitzy, my neighbour at plot 11. Fitzy is slowly moving to a new plot, there are two blackcurrant bushes on this new plot, that he does not want. I was talking to him earlier about the delights of blackcurrant cakes. 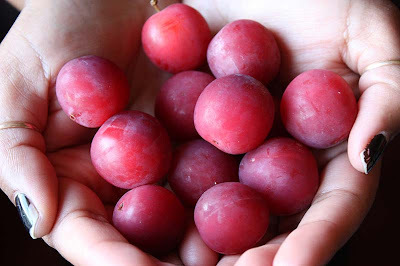 He said that he didn’t have the patience to harvest the tiny berries, plus the bushes were overshadowing his onions, which have been a poor harvest. So he was going to dig up the blackcurrant bushes and throw away, that’s when I said Ooh if you don’t mind, we’ll take them off you. 'Your very welcome to them' says Fitzy. We agreed to dig them out this weekend. I know exactly where they are going. At this present time, I am fortunate to be able to set aside time for blogging. However, I am realistic to know a time will come when I will start lapsing and my blogging will probably become weekly entries. 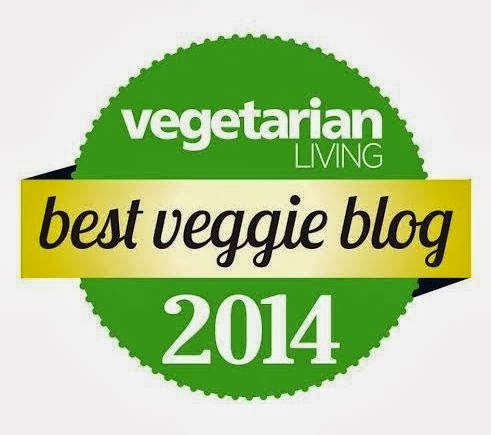 For now, every day of blogging is a bonus, so let us enjoy it while it lasts. The tart below is made with the cherries I picked from a tree in Essex. 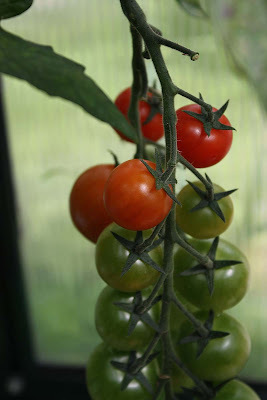 These cherries were originally yellow with a bright red blush, but have ripened furthermore on the window sill. I think they are a variety known as Ranier as the flesh was pure yellow, very firm and finely textured, but I may be wrong. 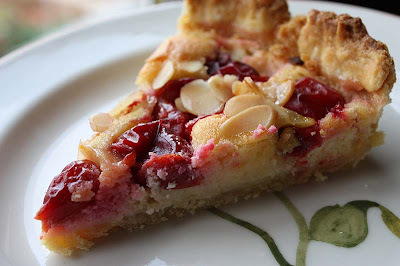 We ate most of them au naturale, just popping them into our mouths like sweet popcorn, but I had about 250g left, so I made this cherry almond tart. 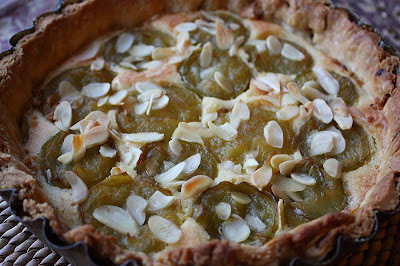 This tart is pretty much based on the greengage and almond tart. On cooking, the cherries tasted quite sour, but it was nice washed down with a cuppa Darjeeling. Heat the oven to gas mark 6. Dice the butter into a bowl. Add the almonds, caster sugar and combine, then add egg and mix until your achieve a thick paste. Spread the paste in the pastry case. Place the cherries cut-side up in the frangipane with a little space between each one. Scatter the flaked almonds over the tart. 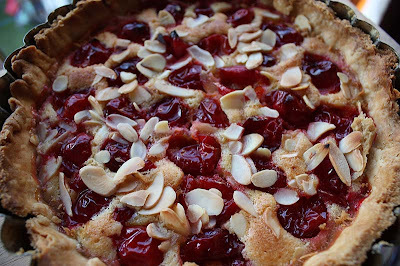 Bake for 25 – 35 minutes, or until the frangipane is firm and swollen, the cherries will bleed a little, but that add more colour to the tart. If you wish, dust with icing sugar before serving. 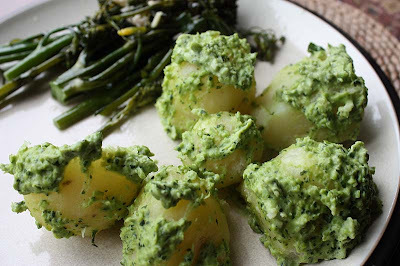 I used it for coating some boiled Desiree potatoes, served with garlicky sprouting broccoli. As a dip for pitta bread – prettily disguised here as quenelles. 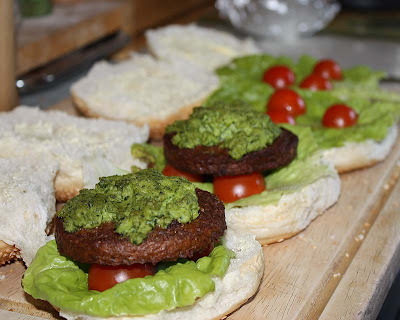 And finally as a veggie burger topping with our own lettuce and tomatoes. I know it ain’t the prettiest of foods, but it sure is packed with flavour. 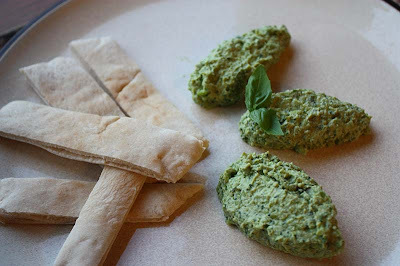 I owe this recipe to Jacqueline, if it was not for her pea pesto recipe, I would not have gone down this route. 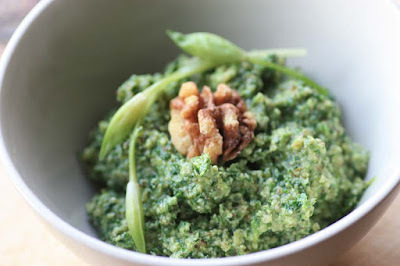 It was a good way for me to use up the freshly podded green peas that were starting to go just that little bit over. 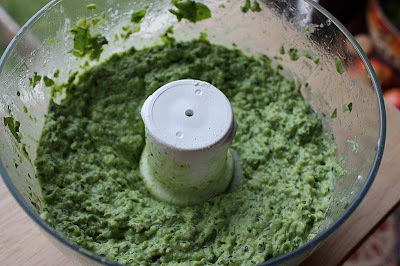 Blend all ingredients in a food processor until smooth, or with a bit of texture, that’s the way I like it. 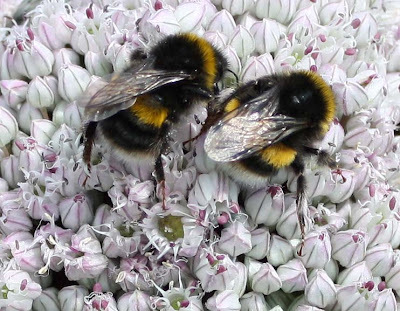 It took me a while to appreciate Bumble Bees and now I do. 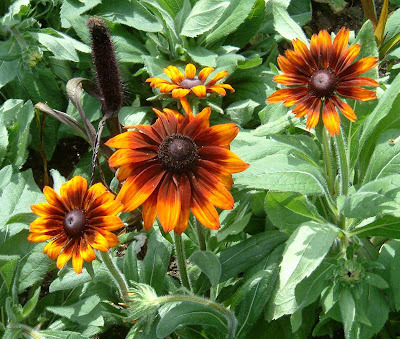 Watching them trundle slowly around the plot, from one plant to another has been soothing, insightful and amusing at times. 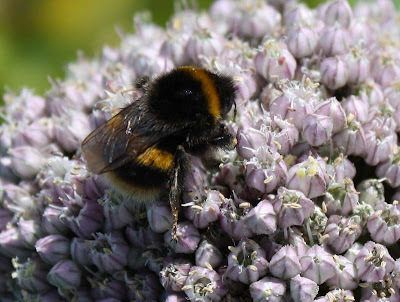 Early this year, I deliberately left some leeks in one of the beds to flower and go to seed for the bees. 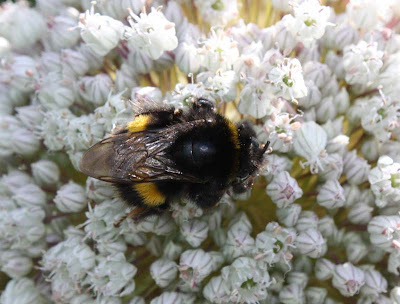 The leek stems have come up beautifully producing big, fluffy, white, cotton ball heads, which have been attracting bees for the past two weeks. And the bumblebees have been repaying me in kindness by pollinating my flowers, fruit and vegetables. 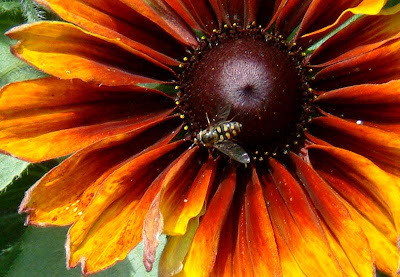 These bees were so self-absorbed in their tasks, that they were happy to pose for me while I took a picture or two. Ah I am happy, it’s been a good year so far for Plot 45. 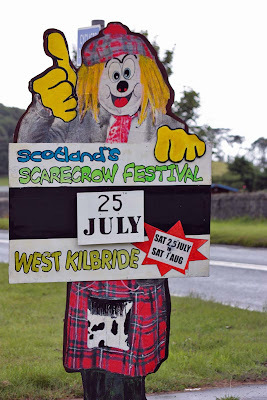 On Sunday, even though it was raining we decided to give the allotment a miss and go to the West Kilbride Scarecrow Festival. We stumbled upon the Scarecrow festival a few years ago by accident when we had Ds sister up for a long weekend and we took her out for a drive to Ardrossan in the West coast. Every scarecrow we drove past looked very impressive, so even though it was raining, you can imagine my response when D said did I want to go and see them again. Yes, yes oh yes. I was surprised that many of the scarecrows still had their heads on, as in other parts of the country, I am sure they would have been headless and vandalised, but i guess there are still some places where there is some community pride. The drive was not pleasant, rain from the sky and then the gushing from the car wheels in front. But by the time we got to West Kilbride, the rain had stopped. Yay! 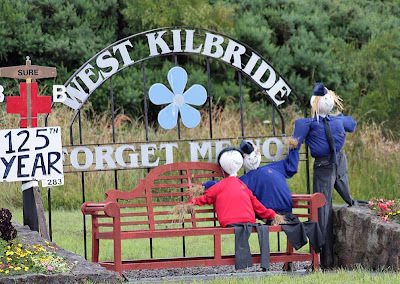 So here are a sample of some of the residents at West Kilbride. 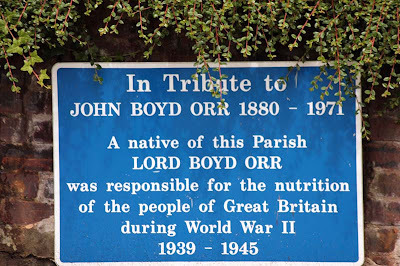 And here's the food related bit. I originally made this lettuce tart back in 2005 when we moved into this flat and our then new neighbour Nessie gave us a good handful of lettuce. This year I find myself with lettuce that is starting to bolt, so I decided to make it again. 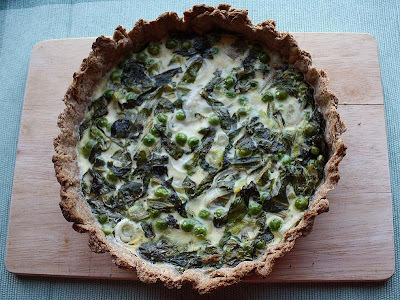 I am very fortunate this time as I have an allotment now and all the vegetables in this tart are my own. 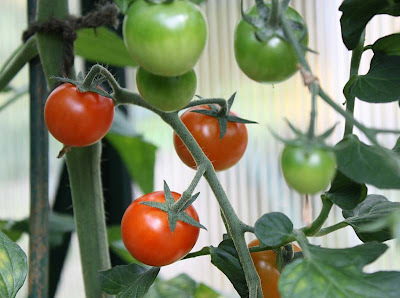 Hence the reason I am entering this into the Grow Your Own (GYO). Grow your own which was started by Andrea's Recipes. 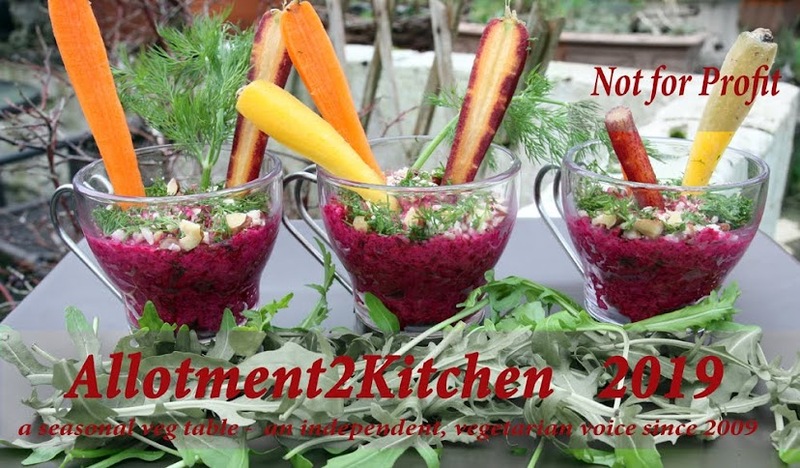 I think it is a great food blogger event as it also supports the principle behind my blog that celebrates the foods we grow or raise ourselves and the dishes we make using our homegrown produce, plus it is a good opportunity for me to raise A2Ks profile in the blogging world too. GYO#39 is being hosted by the lovely Amy of Playing House. I really like Amy's blog she frequently showcases the work of other bloggers not just in relation to food, but crafts of all kinds, which I think is a fantastic way to share ideas and inspire others. I know, I know looking at it there is something very 1970s about the tart, I think it may be the wholemeal crust, but this is supposed to be a rustic and homely tart, that uses frugal and thrifty ingredients, but that is not to say it is not tasty. It is very tasty, light and fresh and I really liked it! I hope you do too. Sift flour and salt into bowl, then add the residue of the bran from the sieve back into the bowl. Add the butter or margarine then rub it into the flour with your fingertips, continue until the mixture looks like breadcrumbs, then add the water a little at a trim and use your fingers to press the mixture together to form a dough, then knead lightly for a couple of minutes until smooth. Then roll out onto floured surface and line an 8 inch tin and trim the edges. Bake at gas mark 6 for 15- 20 minutes until the pastry is set. While tart pastry is cooking, fry the onions, lettuce and peas gently in the butter for 5 minutes. Remove from the heat, mix in the mint, cream, egg and seasoning, pour into the tart tin. Bake for 30 – 35 minutes until the egg mixture is cooked and firm to the touch. Today's weather forecast, four seasons in one day. 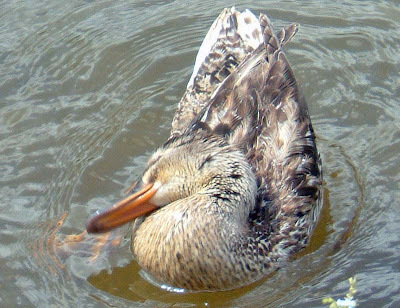 I took this picture a couple of years ago whilst in Oban, Argyll and Bute as it made me smile. Oban is one of those places we take family and friends too when they come up to visit. 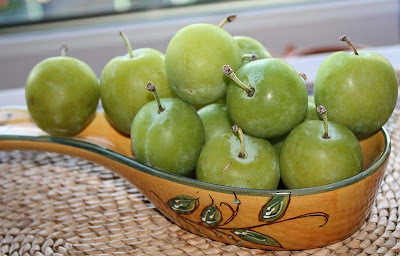 Anyway, onto food - I bought these greengages from a farmers shop while I was in Essex last weekend. I have never had them before so was looking forward to trying them. I decided upon this recipe for Greengage and almond tart. I made the sweet shortcrust pastry from scratch and then proceeded with the filling which was simple enough. We did not eat the tart on the day, as I think frangipane style tarts and cakes are best eaten a day later, but that’s just me. D said he didn’t mind it at all, but would have preferred the tart warm with a bit of vanilla ice-cream or whipped cream. Me, although I liked the frangipane, I found the greengage twang a tad bitter for me taste buds. Well at least I’ve tried them now. I don’t think I will be eating, or cooking with greengages in a hurry, but you might like them. Go on give them a try, while they are in season. I didn’t want to dwell over it this weekend, but there has been more thieving on the allotment site. Big time in fact, a number of plots holders, especially some of the new plot holders have had a lot of their tools stolen: spades, drill, hammer, shears, hose and so on. Surprisingly this theft coincides with the return of one particular man and his family, but maybe I am reading too much into this coincidence. What was a surprise to both D and me was that our plot had not been touched this time. I’ve written about this before, but the next time we have something stolen from our plot, I am doing two things: informing the police and getting in touch with the press to do an article around ‘real thieving on allotment sites’, a change from the nice stories you read about allotments. That would raise some eyebrows. I am sure the committee members would be quick react to this, rather than to the constant thieving. Some of the plot holders expressed their anger at the thieving and their thoughts and suspicions that it was someone on the plot. I did not share my views about this, as it would be hearsay, but I did tell them of my own personal experiences of on-going thieving on the plot and the lack of action by the longstanding committee members. Nevertheless, I advised them to speak to the ‘committee members’, otherwise to go along to the next committee meeting which is this Sunday. On another note, I was surprised to learn that the thieves hadn’t stolen anything from the Treasurers plot, where she hoards things like tools from ex-plot holders. Very, very interesting I think. This time last week I was in Essex visiting my in-laws. Here is a photo of the veg box we took down for Ds parents to enjoy. 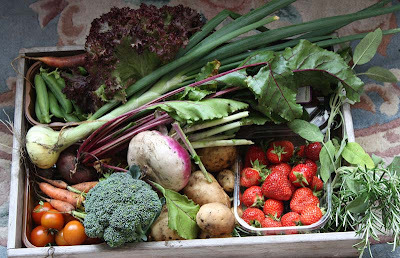 The veg box includes our first tomatoes and beetroot of the year. 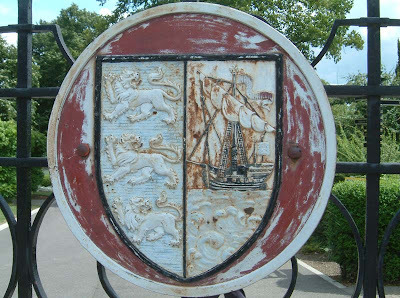 I've been to Essex a number of times now and have visited places like Basildon, Pitsea, Southend, Colchester, Leigh on Sea, Billericay, Brentwood, East Tilbury, but this time it was Maldon. On one of the days, when the weather was warm, my father-in-law decided to take us out for a day trip to Maldon. 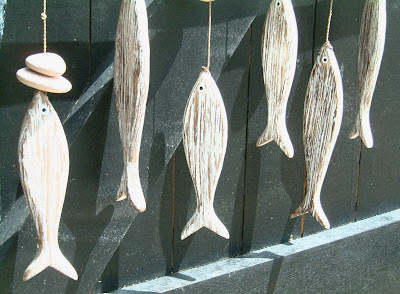 Maldon is famous for its sea salt. It was quite pleasant actually, there were plenty of people about picnicking and enjoying the sunshine - school holidays had just begun in England and Wales. 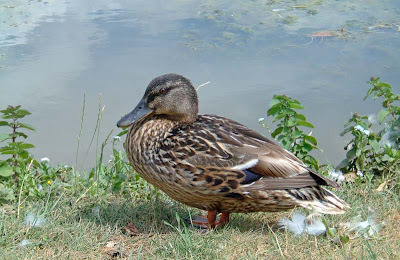 Here are some pictures taken with my small camera. 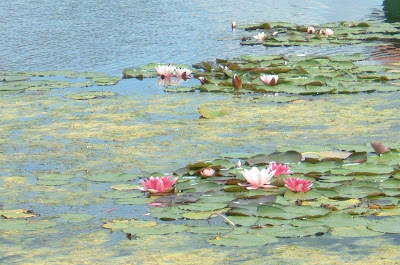 This lovely pond of lily pads was once an outdoor swimming area. Lots of signs like these about. Quirky duck and some pretty marigolds - I think. In the evening, I was treated to some bread and butter pudding… Sorry no picture. It's raining outside. The plan was to go over to the allotment and finish off work we didn't get round to doing yesterday, but it doesn't look too good. We'll give it an hour or so, and the rain may calm down a bit. Otherwise, it may be a house clean-up day. 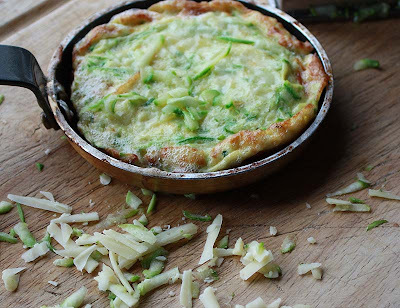 For now, I decided to make a cooked eggy breakfast: courgette frittata. No yellow courgettes for me this year, but I can't gripe too much as this courgette is one of the longest I've ever grown. Beat the eggs in a bowl and season with salt and pepper to taste. Heat the oil in a 7 inch frying pan. Add the garlic and fry over low heat for 1 minute, then add the courgettes and turn in garlicky oil for a couple of minutes. Pour the eggs into the pan and stir briefly, then cook over the medium heat until set underneath and around the edges. Scatter over the grated cheese and continue to cook over a very low heat until the egg is set and only slightly runny in the middle. Because I made these in a blini pan (x4), I finished them off under the grill. But you could, if you wanted to invert a plate over the frying pan, hold both together firm, then turn over so that the frittata is on the plate. Slide the frittata, runny side down, back into the frying pan and continue to cook until set underneath. Today D and myself spent a good 8 hours at Plot 45. Catching up with the work we missed out on from last weekend, but we were rewarded well. 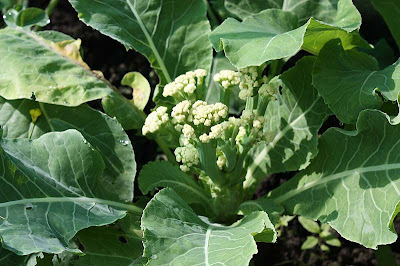 Look at the box below, which contains from the left: purple sprouting broccoli, broccoli, peas, courgettes, rainbow carrots and snowball cauliflower. In the front: strawberries which are still flowering, climbing green beans, some tomatoes and a good handful of raspberries. Here are some up to date pictures from Plot 45 today. 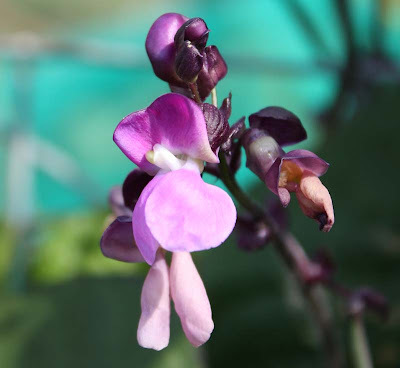 This is the dwarf hestia runner bean I wrote about yesterday. Aren't they pretty? Like red hot chillies. This is the flower of the dwarf purple Queen in all her glory. Look how straight this one is! Blue ballet pumpkin. Yes, I know it's still green. This is supposed to be snowball cauliflower. These have been a great disappointment, each and everyone has pretty much blown. 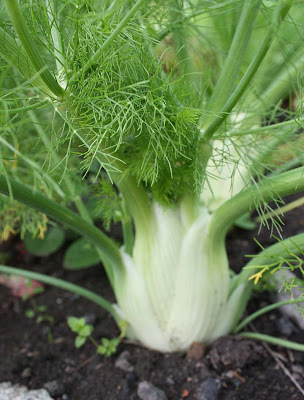 The crown goes to the Fennel. All orderly and looking magestic. 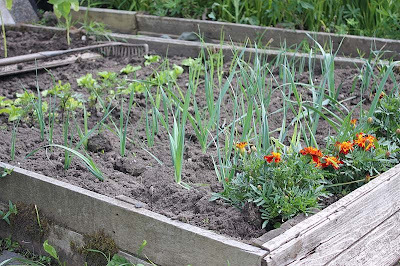 Ah my weeded bed of marigolds, leeks and lettuces. This was the new potatoes bed, which have all been harvested now and stored in a jute bag. Now I can enjoy rest of the evening. Or what's left of it. I picked a generous handful of beans for our meal tonight. 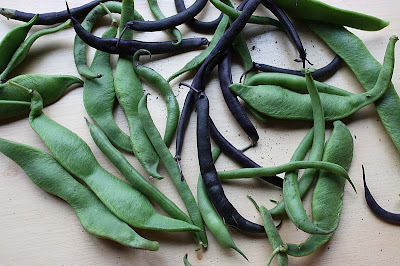 These are hestia runner beans; purple Queen french beans; and speedy french green beans. 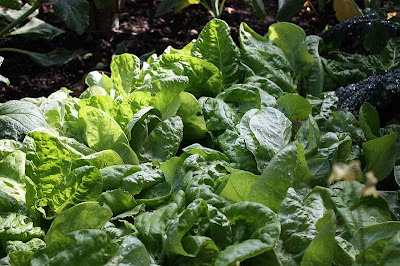 All are dwarf varieties and early producing. They all produce lovely flowers, purple, red and white. 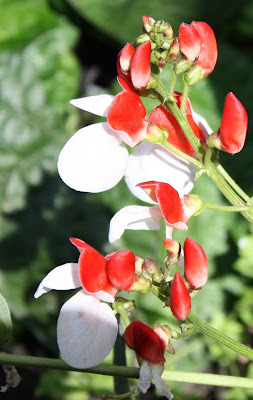 All of which I think should really be grown in pots, not direct in the ground, as the beans get slathered with soil and gushy mud when it rains. 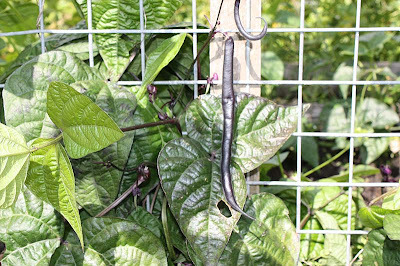 The only one which has been a bit of a hit and miss, are the hestia runner beans – as you can see, instead of being flat, it has little humps like a camel. Tasted fine though. I was reading this article on-line about people cooking non pretentious seasonal food from home and then opening their doors, whether it’s a bungalow, a house, or an ex-council flat to both strangers and friends. 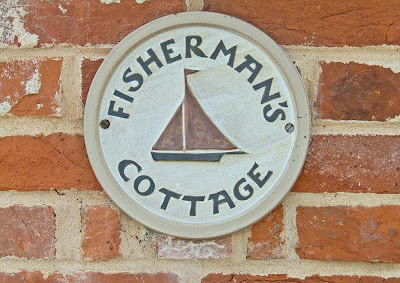 First, I found it interesting, amusing and a little bit endearing that ordinary people were welcoming, sharing their creature comforts, as well as their culinary skills and edible delights with friends and strangers (for a small financial contribution ranging from £15 - £25). I really liked reading about MsMarmiteLovers Underground Restaurant. 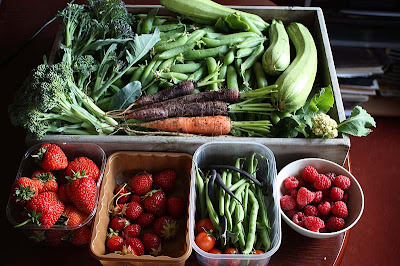 Some of the fruit and vegetables used at these home bistro's were locally sourced from nearby farms, some even from the cooks own allotments. But the more I read, I noted a number of these people cooking from home were professionals in the food industry, some were even trained chefs (charging up to £100). So for some it was really a 'restaurant' run from their home, don’t you think? as some of the menus were quite ambitious such as 'lamb belly confit with razor clams, nori dust and spiced broth and white chocolate and passion fruit vermicelli with black olive caramel and sancho pepper'. Far from frugal and real home cooking I think. In some cases, the trained chefs were travelling and cooking in other establishments, hence the new term 'pop up supper clubs'. This kind of stylish dining is more of a lifestyle choice and something that I can see being very successful in cities such as London, where it has taken off in a massive way. But that is not to say I don’t applaud the concept of home bistros, I really do, I think it’s a lovely idea and even quite humbling. If I had the room in my humble little abode, I would probably do something like this on a monthly basis, Yeah really, and I would be serving creative vegetarian and vegan food – food I like to eat. Maybe it will happen one day. Now please don’t get the wrong idea about me, I am not a big alcoholic drinker. Honest! This is the chemistry student in me that wants to experiment with different flavours. I’ve successfully made my first ever batch of non-alcoholic elderflower champagne, and now it is the turn of the fruit vodka. A few years ago, I went to one of Scotland's first ever Russian restaurants with some friends, and tried for the purpose of research you understand (she says coughing under her breath) a number of flavoured vodkas including pineapple and cranberry. I was so thrilled by the simplicity of this drink, that a week or so later whilst making some homemade jam with supermarket bought raspberries that I decided to make my own raspberry vodka. Needless to say, it was very, very nice. 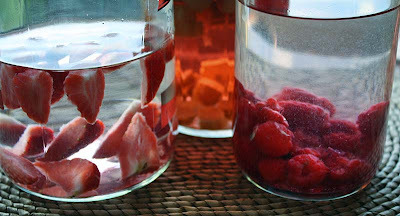 This year, I have decided to make rhubarb, strawberry and raspberry flavoured vodka’s. My mother would so not approve, but some of my friends will. So it will be something bring out and share when alcohol drinking friends come over. The rhubarb has been sitting stewing for awhile, so we got to taste it this evening with some lemonade. 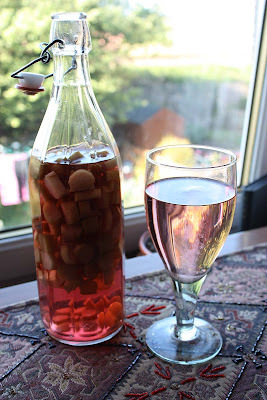 Now, I didn’t think about how the swelled rhubarb chunks were going to come out of the bottle, oh well. 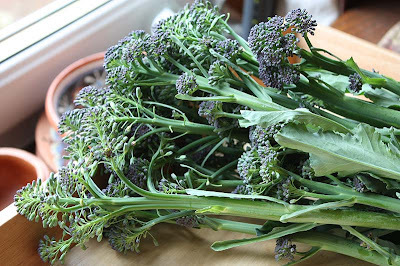 As much as I like purple sprouting broccoli (PSB), and eagerly await its arrival during the Hungry gap, I don't understand why I am harvesting it right now. Yes right now and its only July. Has anyone else harvested PSB recently, or about too? The seed packet is from a reputable company. 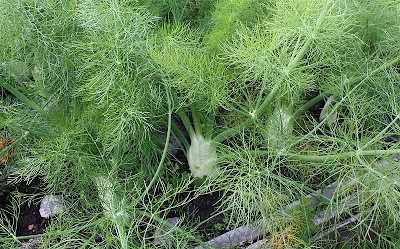 The seeds were packed early this year and expire 2011. 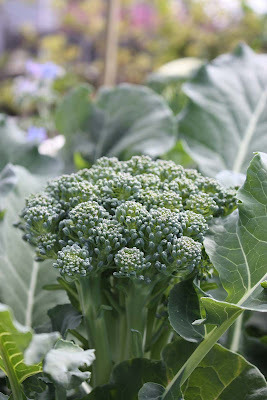 According to the seed packet Broccoli (Sprouting) Early broccoli. 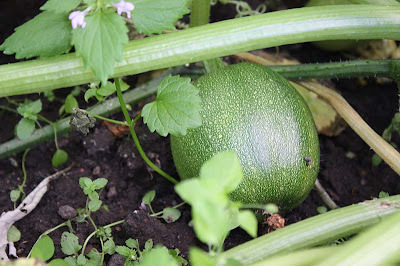 Sow in March -May which I did and harvest the following year between February -May NOT July! If someone can tell me why this has happened I would be pleased to know. Thanking in advance. Yours confused mangocheeks. By the way, it was truly lovely, simply steamed and drizzled with a bit of olive oil.